This cheery little note and photo graced my email inbox earlier this week. I loved that my friend and regular reader had taken time to send this but more than that, I could actually feel her enthusiasm as I read it. Jill was visiting Portland, Oregon – a city that I visited in July and certainly a food mecca. I was astounded by the opportunity to have a meal with local organic produce at every turn, markets strewn throughout the city and an unexpected barometer of food vitality being the ability to find locally brewed kombucha on tap in so many places. Clearly in Portland, it’s about a food philosophy but elsewhere, attitudes towards food are also changing. According to the World Bank Group’s Food Price Watch released on Monday, global food prices are significantly higher today than they were a year ago. Overall prices are 33% higher than a year ago but some commodities such as corn and wheat are up 84% and 55% respectively. This has devastating consequences for the poorest and most vulnerable populations. While gardens are popping up in yards everywhere, it’s also taxing some of the rules in neighborhood associations such as the one in Michigan where Julie Bass faces up to 93 days in prison for planting well-tended garden boxes of organic produce in her front yard. If you haven’t heard her story, do check it out. The city planner says that yards should have trees, bushes and grass? In my own neighborhood, one of our local heroes has taken the idea of making his home into a farm and is now showing others how to do so. See the Urban Farm. Have you noticed any new gardens in your community? Bring a large pot of lightly salted water to a boil. Add pasta, and cook for 8 to 10 minutes until al dente; drain. Heat oil in a large skillet over medium high heat. Saute onions until golden brown, about 10 minutes. Stir in garlic, and cook for 2 minutes. Remove from heat, and stir in balsamic vinegar. In a large bowl, combine pasta, onion mixture, and Gorgonzola. Toss until evenly coated, and cheese is melted. This dish can also be prepared with onions that have been carmelized in advance. I’ve done that in my crockpot; sliced onions, butter, turn it on and leave it. And yes, it’s not vegan or raw but I’ll get around to that later. My husband and I planted a fairly large garden in our front yard a couple seasons ago. In addition to the bounty of vegetables we harvest all year long, our garden has encouraged several of our neighbors (whom we’ve never met) to stop and chat about what we’ve planted. The kids are always very intrigued and full of questions! A few of the neighbors mentioned that we inspired them to start their own gardens. 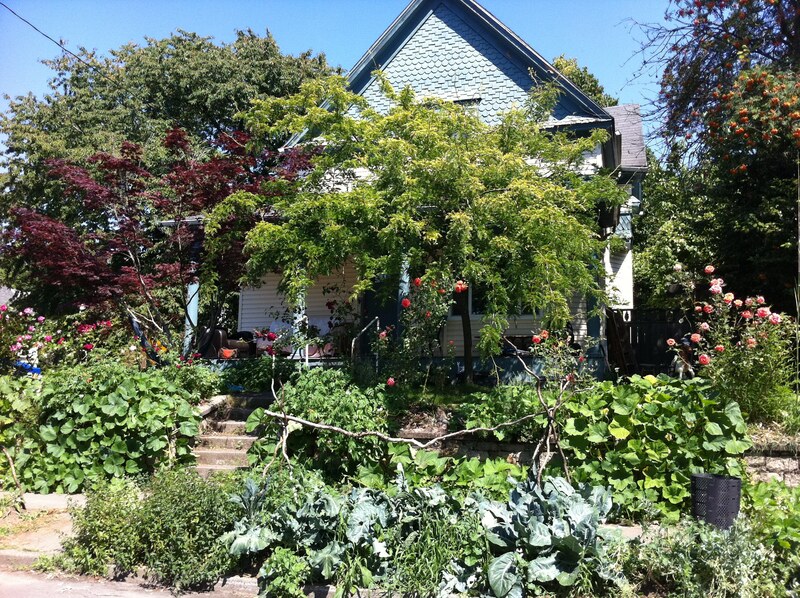 A visible garden does indeed build a sense of community! Good for you Carrie! That’s a great way to get to know your neighbors. Caramelized onions in the crockpot is a brilliant idea! On the gardening front, we plant what we can in our widowboxes. This year we have mint, two kinds of basil, several types of hot peppers (almost ready to harvest – so exciting! ), lavender, thyme, and rosemary. The sage didn’t make it, and the cat eats her cat grass faster than we can grow it! Sage is tough. Mine does very well but then dies off every year. I need to plant more lavender! I haven’t yet – think we’re all a it bit behind the times here- but allotments, the strips of land you can hire to grow food, are very popular indeed. I think if a double dip does materialise we’ll see a huge growth in growing our own. I agree Kate. I’m part of a group here that is studying it and will do a pilot project this year to determine how to do it best. My desire is not so much for myself but to make this a viable option for the masses who really need access to good food. I have a hillside front lawn that I cannot see from inside my house and which is exposed to a curved road on two sides. I’ve often thought how good it would be to garden that area since it gets the lion’s share of the sun, but fencing would be a must (deer) and would be highly expensive – especially so it would be ascetically pleasing. Seeing your friend’s email gives me great cheer. Those who are standing in the way of anyone producing their own food have an evolutionary challenge ahead of them. May they never be hungry. I know it’s a long shot but do you live near a zoo or other animal enclosure? I have read that if you get big cat droppings for the perimeter, it will scare them. Also human hair clippings from the barber shop – kind of weird though. I hope that the city council & planners in Michigan realize that we are overdue for a change from pesticide and herbicide ridden lawns to organic gardens. Yeah, I hope they know how ridiculous they are. Did you see the picture of her garden too? Hardly overrun and wild. We are preparing our garden for the fall planting. We have never had a fall garden, I am looking forward to the lettuces and other greens. I am looking forward to trying your recipe. Jeanne, I am actually making it again tonight and have the pasta cooking as I write. 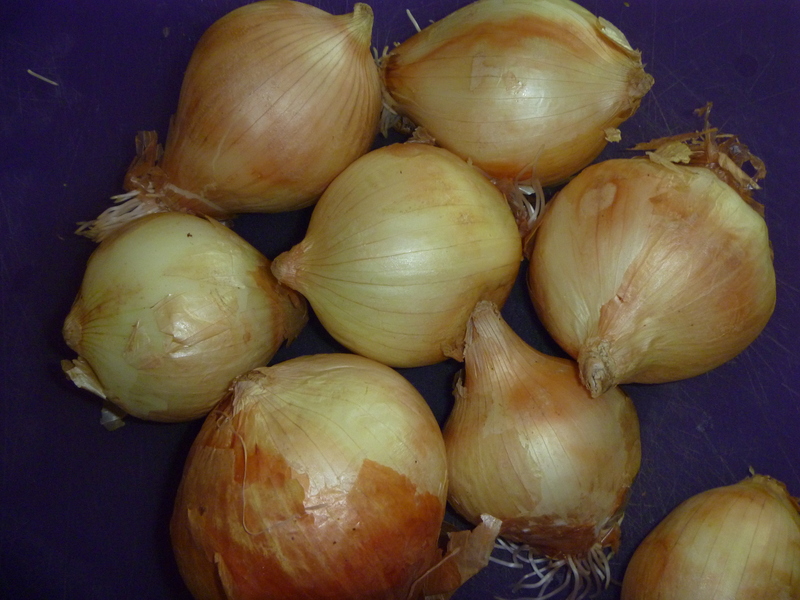 I hope that sweet onions are part of what you can get locally but if not, I can certainly help you with the greens. Interesting to see what people are doing! It looks like a great trend! It is a good trend Montucky! it will take some getting used to for others. Debbie, I don’t know where your town is but I think anywhere that is working to put fresh food into the pantry is a great idea. I just had it again tonight and Yes!, it is divine. Post photos when you do! The pasta dish is really very good! We have two families here who are growing and selling their own produce. And their farm is the first place I go to when I want to buy vegetables. I hit the mall last. Oh and you’d be happy to know, Im now growing aubergine in my window. Pics coming soon! They have such pretty purple flowers. You’ll need to put it where the bees can get to it. I think. urban gardens are the way! for the past three years, we have planted herbs and vegetables in our front yard, also in the easement (the guerrilla garden!) across the sidewalk from our house. thank goodness we live in a neighborhood that not only tolerates this, but seems to relish watching the garden grow. I had read about the michigan woman’s plight–ugh. as this important trend continues to grow stronger, it should change the minds of city-planners and the like. I agree Nancy. When I look at how lovely her front yard is, I cannot believe what she is facing. It’s wrong. Portland sounds like heaven! I’ve been noticing an increase in organic foods in the stores over here lately, and there’s also a new organic caé I want to try out. However, I’ve also noticed the gradual increase in food prices, especially since we got the Euro in 2001. Changing course of the old Deutsche Mark into Euro was 2:1, but now everything costs in Euro (or even more) what we used to pay in DM before. I now spend my entire monthly budget on food only and find it very hard to save any mones. This definitely wasn’t the case when I started studying, and I didn’t have more money (rather less) than now. And I know you’re buying good real food so I’m hopeful that this opens some growing opportunities in your community. What a lovely note & gorgeous garden, Tammy! I’m rather ashamed of my struggling little herb patch…shall have to give it some extra TLC this Spring! Yes, honor the seasons. It’s a start. Good for them! We are still reading about some areas that fine people for doing such! do you see gardens in your neighborhood? I’d love to have agarden and grow vegetables… Ah, rules. Always the same things blocking progress. Thanks Rosa. The pasta is really very good and the rules against a tidy, organic garden are crazy. My mom’s thinking of tearing out the lawn in our backyard to make more room for fruits and veggies. Knew there was a reason she loved our trip to Portland ! obviously it had an impact on her! WOW, what a fab garden! Can I just say that I WANT THAT YARD. Unfortunately, my apartment doesn’t have one. It is an awesome yard. Do you do any containers in the window? No, unfortunately, both of my windows get minimal sunlight (only about 3 hours). I have an “allotment” or community garden patch, but it’s far enough from my house that it’s a surprisingly effort to get there and I don’t use it as effectively as I did when I lived on the same street. Would love to hear more about your efforts studying allotments… I’m fairly involved in the community gardening movement. I’ll let you know what we learn. And you will again sometime! Hope you’ll try it and let me know. It was a big hit here. Hurrah for home gardens! Every time I see a manicured lawn I can’t help but wish for tomatoes. The garden is beautiful! Way better than any grass and bushes. We purposefully chose a home that was not in a home association so we would have more freedom with our front lawn. A good friend of mine has turned her front and back yards into gardens. We inspire each other with our gardens and exchange tips and tricks. Having a gardening buddy helps out tremendously. Just yesterday the kids were talking about how they can’t wait for the broccoli raab and peas to come up so they can go outside to pick a snack. That was music to my ears! That is music. What a treat and I like your idea of having a buddy. The community garden that I visited in Miami had a mentor program when gardeners were having difficulty. Oh, the recipe looks wonderful, too! It gives me something to make with my 3 lb onion from the farmer’s market! Even though I didn’t think those crock pot onions had turned out, they did. They were perfect. Delicious recipe, Tammy. I once ate fried sweet onion in TX, it looked like a beautiful flower and tasted so good ! Our garden is being very generous this year, lots of rain first and now a real heat wave. I have noticed more “balcony gardens” in town and more farmers’ markets here and there. balcony gardens are beautiful to look at and to grow. That sounds perfect. Love that photograph…all I can say is hmmmm, the people in that house will be eating well! Don’t you think? It is such a fun picture. Our neighborhood association is one of those that believes in ‘trees, bushes and green’. Vegetables are strictly forbidden. We’re trying to get changes, but it’s going to be a long fight. The picture of the yard in Portland is very impressive and — dare I say? — beautiful. They’re going to need to make changes as these things get challenged around the country. i was just in portland too! in july!! man, just missed each other. Actually this was from my friend but I was there in July! I’m sad to say that I haven’t noticed any new gardens around here. We tried growing our own veg. What a miserable failure that turned out to be. Well, it’s not for everyone which is why we always have to thank a farmer. We took our garden out years ago. I regret it but it was so much work. We now have one very productive cherry tomato plant and we love it. That’s the only new garden growth around us. I like the sound of the pasta. I think it was the Gorgonzola that got me. Gorgonzola is blue creamy magic! Spending time in jail for planting veggies in HER garden? Ridiculous! I’m sure the city makes valid points, but overall, who’s to prevent someone from doing a good work. (I still have to click through for the full story). The pasta recipe sounds delicious, and we can always try new recipes to use our onions up. And her garden is so nice. When you do click through, you’ll be amazed. Recipe looks delicious! And that’s my dream yard (and my husband’s nightmare). I think my husband would find it a nightmare too.